With the ever evolving Tune-Yards heading to our shores, Getintothis’ Matthew Eland witnesses a group at the peak of their powers. 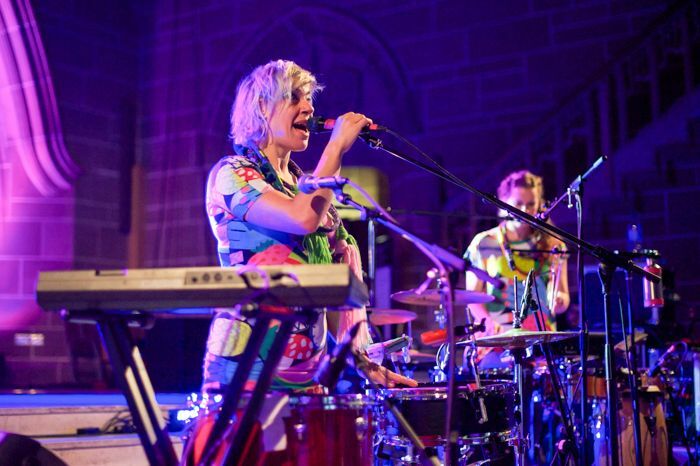 Questions about identity and how to live are at the forefront of many peoples’ minds at the moment, and as such, Tune-Yards (or tUnE-yArDs, should you wish to use the correct stylisation) seem like the right band for the right time. I Can Feel You Creep Into My Private Life, their fourth album, might one day be seen to represent a snapshot of how it was to live slap-bang in the middle of the sixth extinction: a postcard from that stage in the Anthropocene when people started to realise that something was very, very wrong. The lyric that sums all this up comes in ABC 123, when Merrill Garbus, watching the Califorian forest fires, breaks the rhyme structure of the preceding verse and “silently suggests” the investment of a generator. It’s perfectly pitched: furtive, shoehorned in almost as an afterthought, and hinting at the seam of panic running beneath every intimation of doom in our social-media haunted world. A lot of the press for the album had focused on another subject tackled by the album: that of white privilege. In the run-up to writing and recording, Garbus attended a six-month meditation workshop focused on “moving white people to act as part of a multi-racial majority”. If this seems to you to be self-involvement verging on self parody, then you wouldn’t be the first to level the charge. But actually, after spending some time with the album, it makes a lot more sense. Firstly because, if you’re already au fait with Tune-Yards, then you’ll know that this is exactly the kind of thing they’d do; secondly, as she’s acknowledged, Garbus has frequently looked to the Africa diaspora for inspiration in her career, and some kind of reckoning was probably due. I’d surmise that a lot of the ridicule she’s faced as a result of all this forces her (and by extension, many of her listeners) to examine this central concept of white fragility, and following on from that, her role in society: that of a white woman with a platform singing about race. Lofty stuff, perhaps, but all this internal examination of privilege and fragility, colonialsim and complicity, counts for nothing if the external-facing aspect of it isn’t up to scratch. Judging from the steadily increasing size of the venues she’s been packing over the last decade, there are plenty of people keen to come along for the ride. First though, the support. If we told you that Boogarins, from Goiânia in the heart of Brazil, were on first, then you might expect to be told about samba beats and the sounds of the carnival, given the act they’re supporting. But no; Boogarins are something much more murky and interesting. The cavernous interior of the Albert Hall almost causes the low end to swamp everything, but the In-Rainbows-era-Radiohead-esque chord progressions and guitar lines are still just about audible over the bass. Singer and guitarist Dinho Almeida plays the whole gig with a great big smile on his face, hopping from foot to foot, yelping and whistling into the mike, but despite the sunny disposition of many of their songs, something darker is hinted at beneath; further reveals are granted in a series of proggy jams. The star of the show, though, is drummer Ynaiã Benthroldo: firm, focused, and in possession of an array of ingenious array of fills and flourishes, he brings stability and propulsion to the outfit. Worth further investigation, for sure. And then it’s time for Tune-Yards. Garbus emerges in overalls and stocking feet (the better for manipulating the NASA-grade bank of delay pedals in front of her), accompanied by bandmate Nate Brenner and drummer Hamir Atwal, and begins with Home. Initially, this isn’t the most obvious choice for an opener, with Garbus staring straight ahead while repeating She’s a fool in choral drone over a slow drum beat. But then the fuzz bass kicks in and Garbus is at the front of the stage, improvising a haka and waving her drum-pad sticks over the heads of those in the crowd, some of whom are already going nuts. From there it’s straight into album highlight Look at your hands, the insistent 80s drum beat calling to mind Speed Demon by Michael Jackson. Highlight of the set is Colonizer the most provocative song on the album and source of much ammunition for Garbus’s detractors. Built around the refrain “I use my white woman’s voice to tell stories of travels with African men” and a heavily distorted sample of someone intoning Colonizer, the lyrics soon give way to a lengthy jam that showcases their newfangled musical agility. In the past, Tune-Yards would have to build up an internal structure of delays and repetitons to form the foundation of the song before it could begin; here, with the drums, bass and synch taking up more slack, there’s room for improvisation, and the result is an absolute banger that incites much rapturous enthusiasm in the inner rows. Much of the material is from the newest album. One well-received blast from the past is Gangsta. Its central themes of authenticity and inner-city violence highlight how the band’s current concerns have always been present, albeit obscured much more by the quirky pop before now. Super-mega-hit Water Fountain is deployed only four songs in, and it’s a testament to the strength of the set that the flow and balance of the evening isn’t disrupted as a result. This reflects Garbus’s recent work as a DJ, and shows how the band is moving more into dance music territory. Their more ramshackle quirks are being replaced with cohesion, making for a more emersive experience. Adding to this their willingness to tackle the big questions, even at the risk of ridicule, sees Tune-Yards go up a few notches in regard and renown with each album, a process likely, on this evidence, to keep continuing.